I finally got Nick to mount a ceiling hook in the laundry room last night and my macrame fantasy has now come to fruition. I used some hemp cord I got at Hobby Lobby (about $6 with coupon) and followed this YouTube tutorial suggested by reader Mary. It was super easy (except for making sure things didn’t get twisted up). For the top I just used a key ring. It was a little tricky to delicately wrestle the plant into the hanger without destroying all the trailing pieces, but I managed somehow. I’m keeping my eye out for a prettier basket or pot to replace the basic plastic one from the nursery. In addition to being a haven for plants and cats, this little nook is shaping up to be a very convenient place to stage everything for Jack’s birthday tomorrow–all this stuff would be cluttering up my kitchen counters otherwise, but here it’s out of the way while still being easily accessible. Speaking of cats, I keep them from messing with my houseplants by spritzing the leaves with this stuff* every week or two. It really works! I’m so excited that it’s Friday, y’all. I’m really looking forward to celebrating Jack’s birthday tomorrow and enjoying some peaceful family time on Sunday. And then next week is the Fourth of July, when everyone from my mom’s side of the family gets together to celebrate at my grandparents’ house. I love summer. Thanks for reading, y’all, and have a great weekend! *That’s an affiliate link. If you buy that product from Amazon after following that link a teeny tiny portion of your purchase will go to me for sending you there. 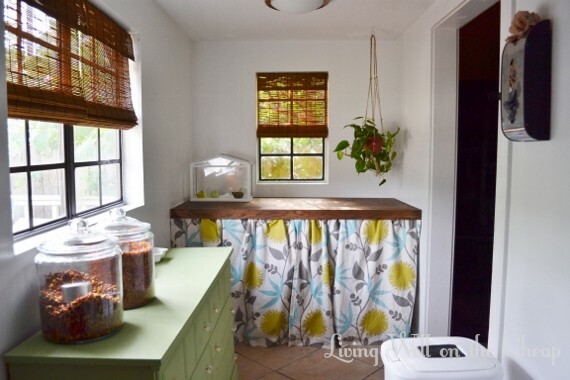 Gah, your laundry area keeps getting cuter and cuter. I’m torn between being totally stoked for you and totally jealous. Have a good weekend! Haha thanks! I vote for feeling stoked. I LOVE the fabric you chose for the table and the color you chose for the dresser. I see why this may be your favorite room. And Happy Birthday Jack. Hope he has a great party, the confetti colors are adorable.